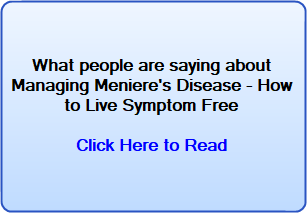 One unfortunate truth about Meniere's disease, is that it indirectly affects the whole family. It can be very upsetting to see loved ones in such distress.To see once, lively healthy family members suddenly struck down in such a debilitating manner. It can be stressful having to be careful all the time on their behalf: trying not to make too much noise, tip-toeing around on tender-hooks, worrying all the time. Stressful having to look after them all the time. They may have to suddenly stop working, affecting the family income. In the time we have spent corresponding with people over Meniere's, we have often been struck by the dedication, care, and the commitment to finding help by partners, siblings, children, grandchildren, sometimes unfortunate young parents, and friends of Meniere's sufferers. People who are not satisfied with their loved ones to be told to just take the medicine and live with it. These people are an inspiration. For all the stress and worry I am sure you are feeling, just think how your loved one, who is suffering with this condition is feeling. Apart from the obvious symptoms you can see, there is the loss of dignity and self confidence. 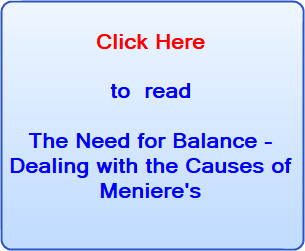 No matter how caring and supportive a family there is, Meniere's is still a very lonely, depressing condition to have to live with. Imagine not being able to join conversations because you can neither hear properly nor concentrate. Often the noises in their ear, like some kind of sick torture, are enough to drive them crazy, these are usually the very least of their problems. They will need your help and lots of love. You will need patience and understanding. They may look fine one minute and the next they could be moody, exhausted or reeling with vertigo, depending on the severity of each attack. It may be confusing for you, but again imagine what it is like for them! It is wonderful that you are searching for help for the person you want to help. In practical terms, you can help them by giving them something to smile about. If it is possible and practical get them to do things they enjoy. Smiles and laughter can be a great remedy, help them forget and relieve the symptoms. Almost for sure, stress will have the opposite effect. If they have to adjust to lifestyle and dietary changes, which most often is the case, you can help them stick to it. In chronic cases, they often feel they just want to give up hope. A little tenderness will go along way. �I was at my lowest point and having multiple episodes everyday, totally exhausted but it was virtually impossible to quit work at the time. As you may have read on this web site and others, a set of quality nutritional supplements has enabled many of us stay symptom free. This has been proven for many years now. Often it is family or friends who persuade reluctant, skeptical sufferers to try these supplements. It may be too much for a sufferer to sit searching the web for information. The screen can spark attacks. By educating yourself about this condition you can help them. It may be the family who are skeptical about the supplements we use, so have an open mind for the sufferer�s sake. In recent times we have spent almost all of our time researching and studying underlying causes and triggers. After 12 years of supporting sufferers and over 7 years researching, we can now say categorically that nobody has to live with this horrible condition that can ruin not only the sufferers life but that of partners and whole families too. Divorces are common, and suicides are not unheard of. The best thing you can do to help both your suffering friend, partner or family member is to get educated about this and help them find their underlying cause. With that done and Meniere's gone you can get them back to their old self and start enjoying life with them again. Everybody can find their underlying cause(s) deal with it and get back to normal again. If you would like more information on this click here. We are here to help so never hesitate to contact us. If your partner or family member suffers from vertigo this is what he or she sees, on a good day.